Beginning in 2011 and spread out over five different series under the vision of writer Erik Burnham and artist Dan Schoening (with the occasional guest-penciler and backup story writer), IDW’s Ghostbusters ongoing “title” is—perhaps appropriately—a strange book. I’ve written before about the uneasy relationship between film and comics. And while there are a handful of film adaptations that stand on their own as excellent comics, I can think of very few comics that satisfactorily continue the stories of a certain film or films (BOOM! Studios’ now finished RoboCop ongoing is a definite exception). IDW’s Ghostbusters succeeds (and sometimes falls short) in its attempt to tell the further adventures of Ray, Winston, Peter, and Egon in ways that are unique to the medium of longform comics storytelling. Right off the bat, a crucial element that makes Ghostbusters work as a comic is Schoenings hyper-stylized character designs. Rather than opting for the uncanny valley of pseudo-photorealistic characters meant to resemble famous actors, Schoening imbues each character with a fully unique design. Describing an artist’s style as “cartoony” is extremely reductive and cliche, but Schoening’s work on the title genuinely feels animated in how it emphasizes facial expressions and simplified character looks. Schoening even dabbles in experimentation in Ghostbusters: Get Real, in which he mixes of the established look of the comic with the DiC cartoon’s house style. 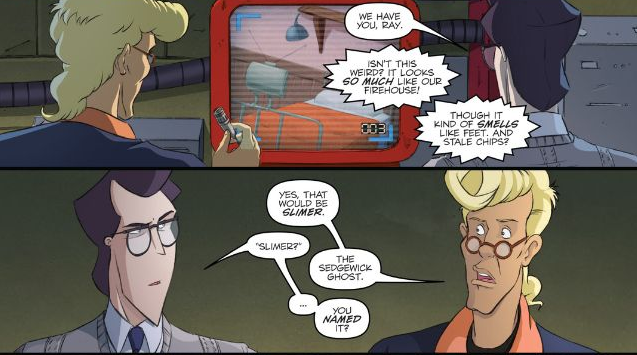 The Ghostbusters line (with the exception of a few fill-in issues by other artists such as Doc Shaner) has a very distinct and somewhat sophisticated visual sense that also enables it to feel like its own work rather than a pure attempt at cashing in on a pair of 20-plus year old movies. As a writer, Burnham’s work on Ghostbusters is interesting because he’s telling one large story about characters whose adventures have always been largely self-contained. As a positive, Burnham has been able to improve upon details of the original story that have become outdated or were in desperate need of expansion. In particular, he has Janine evolve from the Ghostbusters’ comic relief Girl Friday to a capable and competent nerve center for the entire team as they pick up more and more members. Winston really benefits under Burnham’s pen because he’s given a fully realized life. 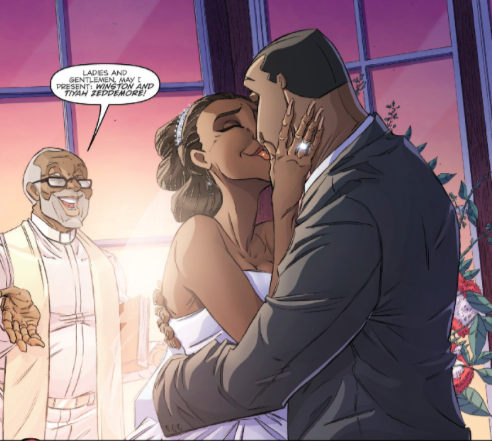 Winston’s ultimately semi-tragic relationship with his girlfriend-turned-wife Tiyah is even the emotional core of the second series’ pull-out-the-stops finale “Mass Hysteria.” While the Winston of the films (and the actor who originated the role, Ernie Hudson) has historically been the victim of racist studio meddling, comics Winston is given ample spotlight. One of the most intriguing storytelling decisions in the book is that it deliberately keeps (Venkman’s love interest) Dana Barrett off the table until much later on, with the mystery of her absence adding some tasty pathos to Venkman’s otherwise pretty staid plotlines. On a superficial level, It’s very clear that Schoening and Burnham as collaborators have a deep affection for the original 1984 film. 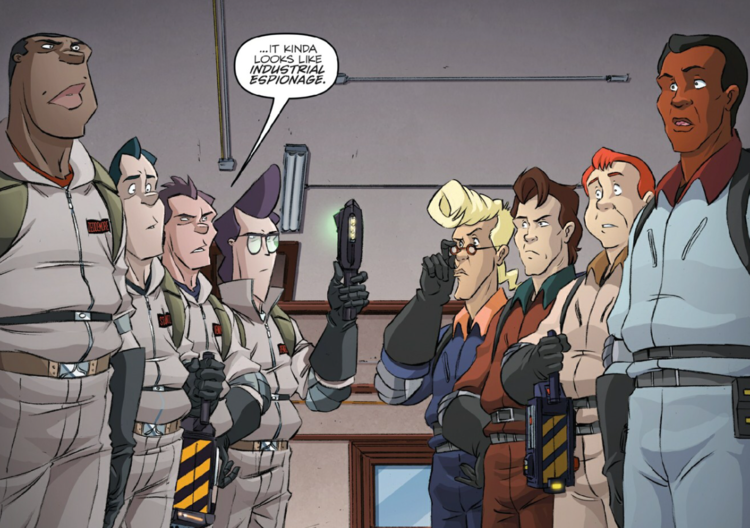 Pages will be littered with visual gags that are either references to minor characters from Ghostbusters (The female college student who can’t guess the cards Peter’s holding appears in the first issue of the current ongoing, Ghostbusters International), or monsters who only appeared in the Real Ghostbusters cartoon, or even unused character concepts only known to die-hard fans (i.e. John Candy’s original concept for Louis Tully, a German man with two large dogs). These references almost go beyond fan-service and into a kind of annotative literacy, with the entire width and breadth of Ghostbusters as a media franchise as its source.This approach pays off some huge dividends in the Ghostbusters: Get Real mini-series, in which the Ghostbusters of the film must team up with their cartoon counterparts in what is essentially Crisis on Infinite Ghostbusters. In taking a huge storytelling cue from the world of superhero comics (there are countless multiple universes with different Ghostbusters! ), Burnham and Schoening have (for better or worse) removed these characters from their roots as fairly grounded real world characters and let them change into a cast resembling Claremont’s classic X-Men ensemble. The unfortunate flip side to this is, as much as Burnham is able to allow many of these characters to grow, there’s just as much of a sense that everything is in stasis. There’s no indication that any of our heroes will ever be in any real danger, or that any of the core four Ghostbusters will truly change over the course of the years-spanning mega story we’re reading. As much as people complain about the 2016 film’s decision to start from scratch with brand new characters, the alternative embodied by IDW’s continued adventures of the old guard feels a little…safe. Burnham clearly wants to tell stories that explore and expand on, say, Egon as a fully rounded character, but his hands are tied for the same reason Bruce Wayne has been in his 30s for 75 years. And while the stories are largely entertaining, many aspects of the book lean heavily on the events of the original films: The “Mass Hysteria” story hinges on Gozer’s sister showing up to essentially re-enact the plot of the original film. Just as Superman and Spider-Man comics today often feel tethered to their greatest hits, Ghostbusters is by necessity stuck dwelling on the past. There’s plenty to criticize in IDW’s Ghostbusters, but with the understanding that it’s working within the constraints of corporate-controlled comics. Most importantly, it accomplishes enough to be a fun and engaging read. Hi! Thanks for the spotlight. Some interesting thoughts! We had fun basing a chunk of stuff on Aykroyd’s initial grand concept (which included alternate dimensions, time travel, and stuff that’s out there even for us!) Besides, alt. dimensions allows for crossovers, which, I admit it, I love. It allows for a lot of stuff. Mass Hysteria (and our first arc in the ongoing) connected back to Gozer — the latter because it was an editorial request; the former because it was a 30th anniversary story and greatest hits nostalgia was encouraged. (At the very least, Tiamat actually “exists” in that she wasn’t invented for the franchise.) For the most part, though, 75% of the comics we’ve done haven’t connected directly to the movies. But yeah, corporate preference has held us back for a good long while from making any permanent changes (aside from additions to the cast.) But funny you should mention danger… (: do watch the next few issues of International. I think the Feig reboot may allow us the ability to do more things in the future. We’ll see! Just wanted to chime in because I love interacting when folks take a thoughtful look. Again, much appreciated!